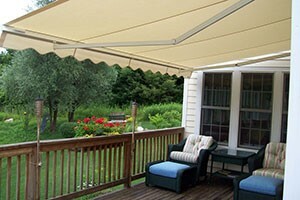 Sunesta’s retractable awnings are a true luxury. With a simple turn of a handle or push of a button, they can be extended and retracted with ease. This functionality not only gives homeowners in New Haven, Connecticut, and the surrounding areas the ability to choose between sunlight and shade on a whim, but also alleviates the burden of having to dismantle an awning to package it for the winter months (and, of course, of having to reinstall it in the spring). At Sunesta, we are committed to making retractable awnings that our customers in New Haven, CT, and the surrounding areas will cherish for years to come. To this end, we are happy to offer the largest selection of fabric styles in the industry, with more than 150 different patterns and colors to choose from. For more information about the custom retractable awnings that we make for homeowners in New Haven, CT, and the neighboring communities, call 1-800-SUNESTA today.